The occurrence of atopic diathesis in hereditary ichthyosis (HI) has not been documented in Saudi patients. The atopic manifestations in histopathologically confirmed HI patients attending the dermatology clinic of king Fahad Hospital of the University at Al-Khobar city, Saudi Arabia is discussed in this study. From the dermatology OPD logbook, all Saudi patients with confirmed HI seen between January 1990 to December 1995 were included in the study. The findings regarding atopic manifestations were extracted into data collection forms and analyzed. During the 5 year study period, 10,455 new cases were seen in our dermatology OPD. Of these, 61 had hereditary icthyosis, with 37 males and 24 females with a male to female ratio of 1.5:1. Thus, the frequency of HI among Saudi hospital attendees was 6 per 1000 new cases. The type of HI was ichthyosis vulgaris in 25 (41%) patients, X-linked recessive ichthyosis in 11 (18%), lamellar ichthyosis in 4(7%), bullous ichthyosiform erythroderma in 2 (3%) and nonbullous ichthyosiform erythroderma was seen in 19 (31%). Generalized pruritus was present in 49 (80%) cases, atopic dermatitis in , elevated serum IgE level was noted in 27 and bronchial asthma in 3 cases. Dandruff was reported in 24 cases, keratosis pilaris in15, recurrent skin infection in 7. Combination of hereditary ichthyosis, generalized pruritus and high serum IGE level was reported in 27 (44.3%) patient. Topical corticosteroids are currently used for treatment of diaper dermatitis. Previous studies have shown the efficacy of sucralfate in the treatment of diaper dermatitis and contact dermatitis in peri-stomal areas. To evaluate the efficacy of topical sucralfate in comparison with hydrocortisone cream in the treatment of diaper dermatitis, the present study was under taken. 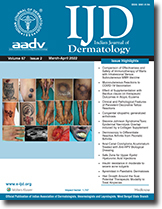 In a double â€“blind randomized clinical trial, 64 patients with diaper dermatitis were treated with sucralfate cream 4% or hydrocortisone cream randomly. The duration of the treatment wad 8 weeks and the patients were evaluated every two weeks until complete healing. The results were evaluated by chi-square test. Complete healing (more than 50% improvement) occurred in 90.6% and partial healing (20-25% improvement) in rest of the patients in each group (p>0.05). Topical sucralfate is an effective, cheap therapeutic intervention for diaper dermatitis. Which has equal efficacy with topical hydrocortisone cream. Tumescent anesthesia is a now an established technique for regional anesthesia of the skin and the subcutaneous fatty tissue. The unsurpassed simplicity and safely of this procedure have opened up the gates for newer indications. We have employed this technique for harvesting split-thickness grafts in various conditions. We have found that this technique is extremely simple in which large areas can be anesthetized for harvesting split-thickness skin grafts safely. The good passive resistance achieved facilitates easy harvesting of split-thickness grafts along with minimal bleeding and long lasting pain relief. We found this to be an inexpensive, safe and simple technique with elimination of risks and expenses of general anesthesia. Atopic dermatitis (AD) constituted about 6% of total dermatological cases and 0.14% of all new cases (165877) attending the outpatient of a hospital. Serum IgE was estimated in 115 patients with AD. It was observed that IgE level was raised in 84%, normal in 12% and below normal in 4% of cases. In the present study the family history of atopic diathesis was found in 66% of the cases. IgE level fell in 14 of 16 patients during follow up who remained free from active disease for six months or more. A total of 500 children from first day of life to twelve completed years of age attending Dermatology OPD of Assam Medical College Hospital were analyzed for pattern of cutaneous disorders and modalities of pre-hospital care received. School- age children formed the major segment (45.0%) followed by pre-school age children (37.8%). Infective dermatoses were 632% and non-infective 34.4%. Bacterial infections (34.4%), eczema (13.6%) scabies(11.8%), fungal infections (8.8%), nutritional dermatoses(7.8%), pediculosis (3.8%), viral infections (2.2%), urticaria (2%), and a miscellaneous group comprising of twenty four categories (8%) were seen. About 65% had not received any treatment prior to attending hospital. Those who received pre-hospital treatment includes self-medication 18.8%, treatment from primary care physician 7.8%, from pediatrician 3.6%, herbal applications 3%, rituals by faith healers 1.6 %, and treatment from dermatologists was only 0.4%. Trichogram is a method of quantifying hair. We report 3 cases of diffuse hair loss of varying etiology in whom the improvement after therapeutic intervention could be objectively documented using trichogram. A case of unilateral parapharyngeal neurofibroma occurring in a 25 year old female with von Recklinghausenâ€™s disease is discussed in this report because of the rarity of such a condition. Parapharyngeal neurofibroma usually arises from the vagus nerve and very rarely they are associated with von Recklinghausenâ€™s disease or Neurofibroamatosis type 1. It typically presents with a longâ€“standing history of throat/neck mass with/without neurological deficit. CT scan reveals a moderately enhancing mass, occasionally with central necrosis or cavitations. This, together with spindle shaped cells seen on aspiration cytology, if done, strongly suggests a neurofibroma and excision of the tumor is the treatment of choice. In this patient no sign of malignancy was detected and the two year followâ€“up period was uneventful. An 11 year old female child had a small painful spot over the scalp of 4 months duration. Earlier, she had undergone a local excision for a similar problem, but it had recurred at the same site after a few months. Examination revealed a skin colored sessile tender firm papule of 3 mm size on the right parietal region. Excision biopsy showed broad fascicles of tumor cells with eosinopilic cytoplasmic granules infiltrating the dermis amongst the collagen bundles, which was consistent with granular cell schwannoma. A case of Goldenhar syndrome with bilateral accessory tragic and other bony anomalies is presented. Granuloma multiforme is an uncommon disorder, which has been described primarily in Central Africa. It may cause diagnostic confusion with granuloma annulare, tuberculoid and some other disorders. A rare report of granuloma multiforme in 48 year old lady is presented. Bullous SLE has a distinctive clinical, histopathologic and immunopathologic features that together constitute a unique bullous disease phenotype. We report a 33 year old female presenting with multiple tense vesicles and bullae on normal and erythematous skin over the body and oral erosions. Palms and extremities showed typical target lesions. She had consumed NSAIDs intermittently for joint pains. She was diagnosed as bullous erythema multiforme and started on oral prednisolone but lesions failed to heal. Patient recollected a history of low grade fever and a photosensitive rash in the past. Investigations revealed positive ANA with a peripheral pattern. A skin biopsy of a vesicle showed a subepidemal blisher. Perilesional direct immunofluorescence studies showed a linear deposition of IgG, IgA and fibrin along the basement membrane zone and perivascular deposition of IgG. Lapus band test showed a linear deposition of IgG, C3, IgM and fibrin at BMZ clinching the diagnosis of bullous lupus erythematosus. A rapidly progressing conyloma acuminata infested with maggots in pregnancy at 38 weeks of gestation, is described. Generalized granuloma annulare is an uncommon form. Lesions localized to sunexposed areas are rare. We herein report a case of actinically distributed generalized granuloma annulare in a diabetic female. Porokeratosis is a specific disorder of kerstinization characterized histologically by cornoid lamella. Lesions of porokeratosis present varied features, often mimicking other dermatological disorders. Herein, we report a case of porokeratosis of Mibelli presenting with verrucous lesions simulating lupus vulgaris.